One of the key figures in establishing the new aesthetic at the Qing court was the Italian Jesuit Giuseppe Castiglione (1688-1766), whose illusionist approach to painting revolutionized Qing court art. Castiglione served at the Qing court for fifty years, working under the Chinese name Lang Shining. A master of vividly naturalistic draftsmanship and large-scale compositions (in Italy and Portugal he had worked as a muralist), Castiglione successfully combined Western realism with traditional Chinese conventions of brushwork in a manner that suited the imperial taste. Descriptively complex, technically finished, and monumental in scale, Castiglione's vividly realistic painting style perfectly served the emperor's documentary purposes as well as his predilection for self-promotion on a grandiose scale. Born in Milan, Castiglione arrived in Beijing in 1715 as a young missionary of twenty-seven and was assigned to work as an artisan in the palace enameling workshop, but with the ascension of the Yongzheng emperor in 1723, his fortunes changed dramatically. In that year, he was commissioned to paint One Hundred Horses (final painting, below; detail of preparatory drawing, above). A large handscroll on silk measuring nearly eight meters in length, the painting took Castiglione five years to complete and is considered his greatest work. For some reason, the scroll was never viewed by Yongzheng. When, in late 1735, it was presented to the newly enthroned Qianlong Emperor, he declared it a masterpiece and named Castiglione his principal court painter. Because painting on silk does not allow for correction or overpainting, Castiglione worked out every detail in a preparatory drawing on paper before he traced the design onto silk. This final draft has recently come to light, providing a unique opportunity to understand how Castiglione modified his style to suit his Chinese patrons. 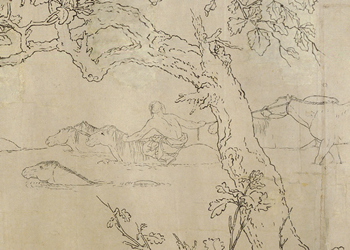 The full-scale drawing is executed in the Western manner, with figures sketched in charcoal and then precisely rendered in bold ink outlines drawn with a European pen rather than a Chinese brush. Castiglione's sharply defined horses inevitably recall those of Li Gonglin, the most revered Chinese master of this genre and the artist responsible for developing a distinctive baimiao, or monochrome drawing style. Compared with Li's lively calligraphic lines, however, Castiglione's drawing appears stiff and labored. The monumental pine trees, which serve to divide the composition into discrete sections, each with its own vanishing point, are another motif borrowed from Chinese sources, but in their complex branch structure, sophisticated foreshortening, and attention to surface textures they are distinctly European in feeling. Even minor details of vegetation, depicted with spontaneous arabesques and cross-hatching — traces of the artist's hand that would have been retained in a Chinese painting, but which are eliminated in Castiglione's finished work — are conceived as forms modeled by light and shadow, in the European manner, rather than through calligraphic conventions. If compared with contemporary European landscape sketches, however, Castiglione's scroll is notable for how much he has softened the Baroque tradition of dramatic chiaroscuro shading (the modeling of forms by the use of light and shadow) by minimizing the stark contrast between light and dark tonalities. 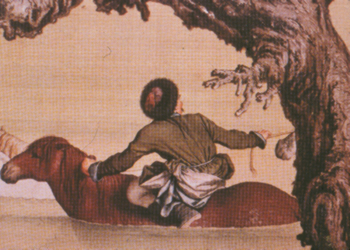 Only the slightly greater density of texturing on the underside of some of the tree boughs and the traces of shadow under the horses' hooves betray the European convention of using a consistent light source as opposed to the arbitrary and schematic contrasts of light and dark in Chinese painting. The creation of a drawing on paper in preparation for the finished version on silk was standard practice in Qing imperial commissions. For such projects, an artist would submit the draft version for imperial approval before beginning the final version, which in addition to being executed on a more precious material, employed expensive mineral colors and was much more detailed. Ultimately, however, this practice inhibited spontaneity. It also encouraged the participation of assistants. Castiglione's concern with descriptive realism rather than with calligraphic brushwork eventually led to a weakening of individual expression and a hardening into stylistic convention.